The cost of buying a house - Which? Learn about the true cost of buying a home, from deposits and mortgage fees to survey costs and the price of using a removals company. When it comes to the process of buying a house, there are more costs to save for than you might imagine - and budgeting for them will help you avoid nasty surprises further down the line. In the video below, property TV presenter Jonnie Irwin explains the costs you need to take into account when buying a home. Around 60% of mortgages come with arrangement fees and other charges for setting up the loan. These fees usually range from around £500 to £2,000. This can feel like an unwelcome additional cost at a time when the last thing you want is to be spending more money - so you may be tempted to apply for a fee-free deal. However, you should take your time to work out whether the fee-free mortgage in question would actually save you money in the long run, as you'll often pay for the lack of fee through a higher interest rate. Need help working out which is the cheapest deal? Which? Mortgage Advisers will analyse the fees and rates of every mortgage on the market to find the cheapest one for you. If you want to go with a mortgage that carries a fee but can't afford to pay it upfront, you can usually add it onto your loan. This will end up costing you more, though, as you'll have to pay interest on it. Once your offer has been accepted by the owner, your lender will carry out a valuation to check the property is worth roughly what you're planning to pay for it. The lender will usually arrange this for you but you may be expected to cover the cost, which is typically between £200 and £600 (see table below). The valuation survey carried out by your lender looks solely at the property's worth – it doesn't cover structural issues and won't highlight problems with the property. To protect yourself from buying a house with defects, you should always have an independent property survey done, too. The most common types of survey are the Rics HomeBuyer's Report, which examines the general condition of the property you're going to buy, and a building survey (also known as a structural survey), which provides a more in-depth analysis of the condition of the property and its structure. However, if you're confident that the building is in good nick and don't plan to do any work to it, you could opt for the more basic Rics Home Condition Report, which is only suitable for modern homes in good condition. If you're buying a new-build property, you should commission a professional snagging survey, which is likely to cost between £300 and £600. Find out more: our full guide to house surveys explains more about the different types of survey and what you'll get in a report. You'll need to hire a property solicitor or licensed conveyancer to handle the legal aspects of buying a property, known as conveyancing. Your legal adviser will either charge you a flat fee or a percentage of the value of the property. You can expect to pay between £500 and £1,500 depending on the type of property, its location and how complex the transaction is. The Land Registry is a government department that keeps records of all registered properties in England and Wales. It charges a fee for registering a property with a new owner. This fee will also vary depending on the property price, but you can expect to pay between £90 and £140. You'll also have to pay for money transfers between mortgage lenders, conveyancers, buyers and sellers, and for searches. These searches, carried out by your conveyancer, are required to identify anything that might negatively affect the home you're buying (eg flooding). If you're buying a leasehold property, you'll also need to pay a fee, which usually remains the same whatever the price of the property. The table below shows how much you may have to pay for legal fees. For more information on the charges and what they mean, check out our full guide to conveyancing. Representative figures gathered from Which? Conveyancing, correct as of April 2017. Your conveyancer may also charge you a flat fee (around £95) to prepare your stamp duty tax return. Stamp duty is a tiered tax on land and property transactions over £125,000, but not everyone has to pay it. This section offers an outline of how the system works, but to find out exactly how much you'll pay use our stamp duty calculator. First-time buyers purchasing properties costing up to £300,000 don't need to pay any stamp duty, and those buying a property priced between £300,000 and £500,000 get a discount. Homes priced up to £300,000 - no stamp duty. Homes priced between £300,000 and £500,000 - stamp duty not payable on the first £300,000; 5% payable on the amount over £300,000. 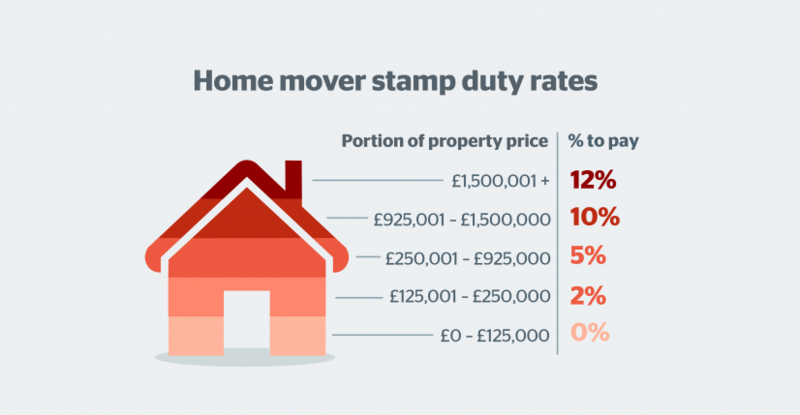 Homes priced over £500,000 - stamp duty paid at standard rates (see 'home movers stamp duty', below). If this isn't the first property you've ever bought but it is going to be your main residence, you'll pay standard stamp duty rates on any property costing over £125,000. 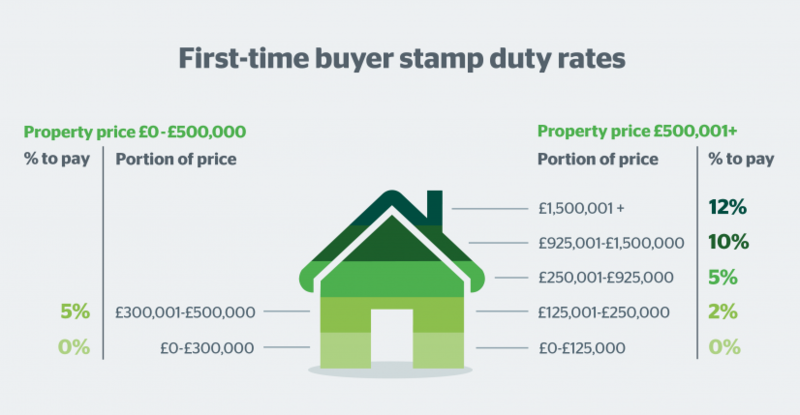 The amount of stamp duty you'll pay depends on the value of the property you're buying, and as it's tiered, you'll pay different rates on different portions of the property price. The graphic below shows the different rates that will apply to each portion of the property price. Use our stamp duty calculator to work out exactly how much you'll pay. If you're buying a second home or buy-to-let property, you'll have to pay an extra 3% and will be charged stamp duty on any property costing more than £40,000. When buying a property in Scotland, you'll usually have to pay Land and Buildings Transaction Tax (LBTT). Like stamp duty, it's a tiered system where you pay different rates of tax on different portions of the property price. First-time buyers don't have to pay any LBTT on the first £175,000 of the property price, while for home movers a 2% rate of LBTT kicks in from £145,001. If you buy a property in Wales costing over £180,000, you'll have to pay Land Transaction Tax (LTT). Like stamp duty, LTT is tiered, meaning you pay different rates on different portions of the property price. First-time buyers don't get an exemption under the Welsh LTT system. Moving costs will vary depending on how much stuff you have, how far you're moving and whether you opt for extras such as professional packing. The table below estimates the cost of hiring a van - which you should only consider if you have a relatively small amount of stuff - or using a removals company for different sizes of house, as well as getting them to pack for you. Buildings insurance covers the cost of repairing damage to the structure of your property. Most mortgage lenders will require you to have a buildings insurance policy in place from the moment you exchange contracts. It’s also a good idea to get contents insurance once you've moved in; this covers the cost of replacing your belongings if they get stolen or damaged. The majority of home insurance companies offer combined buildings and contents insurance policies, which can make it easier to keep track of how much you're spending on insurance and help you to keep track of renewal dates, too. As well as your monthly mortgage repayments, you'll need to budget for utility bills and council tax. You'll also have to set money aside for things like essential repairs and maintenance costs. Our guide on the household bills you'll pay as a homeowner estimates the likely cost of all these charges so that you can get an idea of what you'll need to budget for. If you buy a flat, you'll usually need to pay a monthly service charge and annual ground rent. You can find out more about these in our guide to buying a leasehold property. Are you selling a house too? If so, you'll have additional costs to take into account, including estate agent fees. If you're planning to buy a home and want a free chat with a friendly mortgage expert, you can call Which? Mortgage Advisers on 0800 197 8461 or fill in the form below for a free callback.